Your corporate email and files are critical sources of information, communication, transactions and business intelligence. If any of this gets lost or deleted, it can lead to a loss of business and credibility, and also place your company at legal risk. 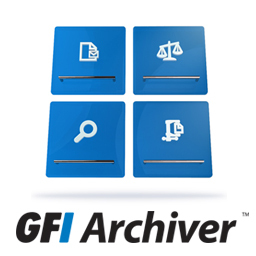 With GFI Archiver®, all company emails and files are automatically stored in a central, secure environment that can be accessed quickly and searched easily. Businesses gain peace of mind knowing their vital company information is stored in a safe and manageable place. Furthermore, with MailInsights® reports you can identify and resolve potential business issues such as security breaches, legal risks and productivity issues by extracting key data from your archive. GFI Archiver works in parallel with Microsoft® Exchange, Office 365™, Google Apps™ and other email servers to copy all emails that are sent and received in a separate server. This enables you to create space on your email server to increase performance, while providing excellent scalability and reliability for your archive store. Storage costs are significantly reduced through single-instance storage (SIS), which stores just one copy of an email sent to multiple recipients and compresses attachments. The File Archiving Assistant (FAA) enables users to do the following without interrupting the workflow: share files and folders; automatically synchronize files between machines; automatically store files in a central archive; and retain a complete file history. GFI Archiver is also able to archive calendar entries from your email server. FAA enables you to have your own company’s shared storage space without relying on third-party online storage. As a result, your files will not leave your company. By setting storage time frames in GFI Archiver, you will be able to provide audit trail functionality for all the company emails and files. This will enable you to meet regulatory compliance requirements such as the Sarbanes-Oxley Act (SOX), the Freedom of Information Act (FOIA), and more. Under these acts, public companies must prove that their internal controls and audit trails are sound, and that their processes are capable of producing certifiably correct data. GFI Archiver’s easily accessible central, stub-free archiving solution means Exchange server performance is faster and there is little need to impose mailbox size limits on the user. Integration with Outlook® means users can have seamless real-time access to the central store alongside their current emails – whether they’re in or out of the office.